Get your grip on – we’re harvesting acorns in this nutty squirrel adventure. Help the squirrel collect as many acorns as possible in the time allotted. Stay away from falling bugs. It’s a fun harvest time! 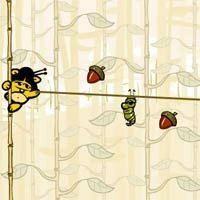 by moving your mouse up and down you change a squirrel’s position on the bamboo tree, then by clicking you release a claw to get acorns. Good luck.